Looking for some help with how to study God’s word or searching for a study to use in your daily devotions? You’ve come to the right place. Follow the links below for more information, or click on the corresponding link in the category cloud in the sidebar to your left. I do not make recommendations for Bible study books or materials other than the Bible itself. I do not provide answers for the study questions in the studies I’ve written. 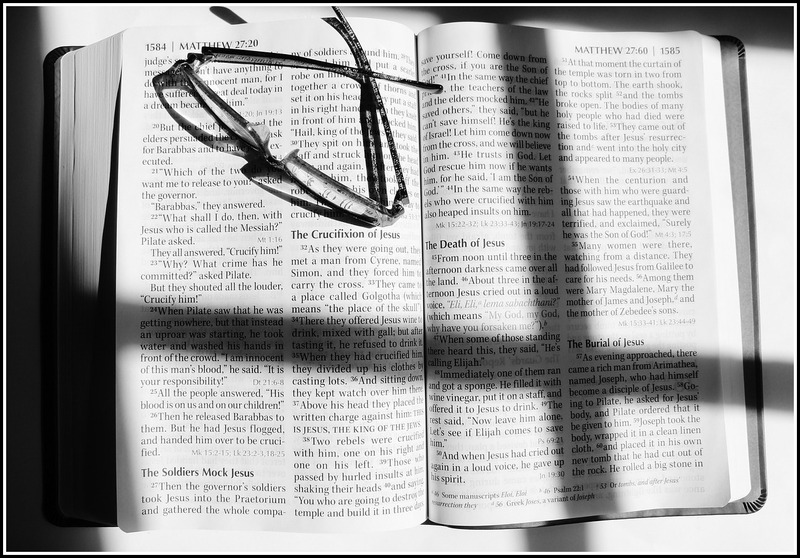 Articles (and resources) about how to study the Bible on your own. It has become my New Year’s Day tradition to publish an annual round up of Bible reading plans. Some plans will take you through the whole Bible, some, through a book of the Bible or a biblical topic. They range in length from a few days to a few years, to ongoing. There’s something for everybody! Click above for this year’s list. to give special attention to women like Eve, Sarah, Rachel, and others. and how they are relevant to Christians today. point us to Jesus our Redeemer. A five lesson study. and why is it relevant to Christians today? An eleven lesson study. How can a rebellious Old Testament prophet point us to Christ? to everyone who believes, to the Jew first and also to the Greek.” This 24 lesson study follows the gospel of Mark as he introduces the good news of Christ to the “Greeks,” or Gentiles. and believe sound doctrine? A seven lesson study. Our current study explores God’s vision for the church – its organization structure and the spirit of its people, through the epistles of 1 & 2 Timothy. but truly in Christ. A nine lesson study. dealing with living in a Christlike way in our role as women. This study includes a Facebook Discussion Group. Wednesday is Bible study day here on the blog. Here, you’ll find miscellaneous, one lesson Bible studies from each book of the Bible. One chapter of Scripture followed by study questions. This sampler series demonstrates that there’s nothing to be afraid of when approaching those “lesser known” books and that every book of the Bible is valuable and worth studying. I was wondering what your views were on “ungodly soul ties”, in reference to past relationships? Hi Amber- Briefly, there’s no such thing. It’s not mentioned or taught anywhere in Scripture, and the only people I’ve ever heard teach such a thing are false teachers- usually those in the New Apostolic Reformation camp. If you’re sitting under the teaching of someone who teaches about soul ties, RUN. Thank you for that clarification. So I guess another question would be, if i was in a previous relationship with someone who I was involved with physically, mentally, spirutally and emotionally. How would I loose myself from that? I am new here and saw the question about soul ties. I am a volunteer facilitator for a local abortion recovery ministry here. We have a topic within the study that talks about soul ties as part of the recovery. We use Her Choice to Heal by Sydna Masse. I had a nouthetic counseling pastor look over this portion and he could not find anything unbiblical about it. Could you expand on that for me? Hi Mary- I’m not familiar with that book, but, as I said in my response to Amber, the doctrine of “soul ties” is not taught in Scripture, and for that reason alone, it should be rejected. It is a man-made doctrine usually taught by those who espouse New Apostolic Reformation heresy- another reason to reject this teaching. Can you recommend any Bible Studies for a suffering marriage? Thank you so much for this blog! God is using you in a very profound way! Thank you so much for your kind words. If your marriage is suffering, the best advice I can give you is to encourage you to set up an appointment with your pastor for counseling. If you husband will go with you, great. If not, go by yourself. While a good book on marriage can certainly be a helpful supplement to counseling, it shouldn’t take the place of counseling. Additionally, once your pastor hears your specific situation, he might want to recommend a different and more helpful book than I could recommend. Dear Michelle what if you only have one session to teach? I have been asked to share the Word this friday at Women’s Monistry for my church. It would be my first time and our leader has not given me many instructions yet. What do you recommend? Really looling forward to your kind reply. I am so grateful Michelle!!! I love your blog and praise God for all your amazing work. Thank you so much for these resources and your reply. I will check those out. Thanks!!! Hi Michelle! Thank you so much for the wealth of information you have on your site. It has been such a blessing to my daughter and myself. I am trying to find biblically sound online bible studies for women that are NOT live. For a variety of reasons, I am not able to commit to a particular time to log on with others for Live interactions. I can, however, do the back and forth commenting. Any recommendations that I can look into? Appreciate you! Did you mean studies besides the ones on this page? Hey Michelle! I’d like to know your thoughts on topical studies? And there is a study you can suggest for a group of single women? Although we should normally study Scripture verse by verse (working our way through a book of the Bible from beginning to end), occasional topical studies, when Scripture is handled correctly, can be very beneficial. In fact, I’m considering doing a topical study (biblical womanhood) for the next one here at the blog when The Women of Genesis (our current study) is finished. “The Ten” (see above under “Old Testament”) is a topical study of the Ten Commandments. Our church is putting together a slumber party/overnight retreat for women. We have women who are new and others who have attended church and studies for years. I’m trying to find something for us to study on this night. Do you have something you could recommend? Most if us have been married for many years, there are a few that are newly married and one that is in a relationship but, not married . Your help would be appreciated. Are you looking for a one lesson Bible study?